Homelessness problem • Herbert’s vision includes more resources, special legislative session, more jail space. Scott Sommerdorf | The Salt Lake Tribune Utah Governor Gary Herbert introduced his recommendations for the fiscal year 2017 budget at SLCC, Wednesday, December 9, 2015. Earlier Herbert toured Innovations Early College High School at SLCC. Gov. 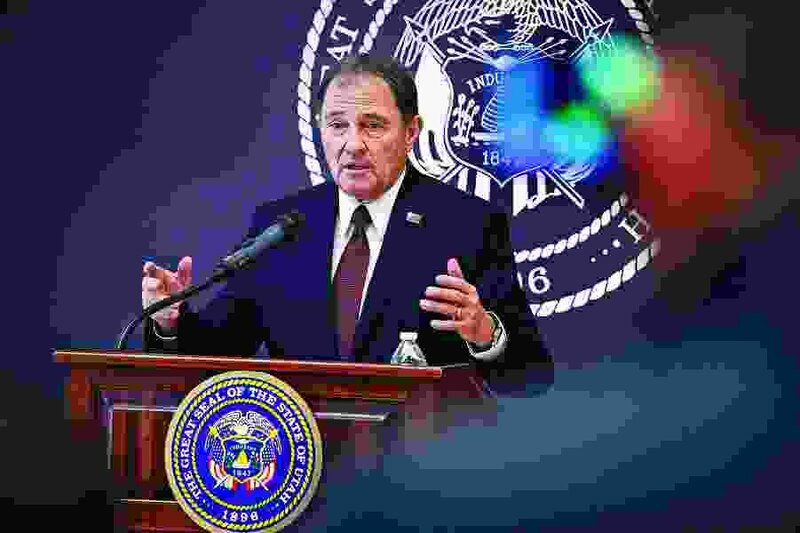 Gary Herbert on Thursday defined what he believes success would look like when leaders finally win the fight to eliminate serious crime in Salt Lake City's Rio Grande district. "I look forward to someday — a year from now — playing tennis on that tennis court there in Pioneer Park," he said during his monthly news conference on KUED-TV. And in about a year after major effort, he said, "we can define success" by seeing families with young children "walk down to Pioneer Park" to "enjoy the beauty of that area," and see people shop nearby and "feel comfortable and safe with what's happening." He added, "We can do it by … focusing and uniting by eliminating the criminal element," and, "I'm setting kind of a goal of a year to have that done and completed. I think we can have significant improvement." Those comments came a day after a closed-door summit in which state, county and city leaders pledged renewed efforts to clean up that neighborhood in the wake of a rash of murders and beatings. They designated Lt. Gov. Spencer Cox as the "point person" to tackle the problem. Though not officially dubbed the "homeless czar," Cox will be the Herbert administration's lead liaison on the issue. Participants in Wednesday's high-level talks did little else to spell out specifics of their plan. Herbert continued pushing for more efforts Thursday by suggesting he might consider calling a special session of the Legislature to provide more resources. He also called for possible reopening of Salt Lake County's now-closed Oxbow jail or using facilities at Camp Williams of the Utah National Guard to provide extra space to jail people who may be arrested in planned stepped-up law enforcement. "Having enhanced law enforcement is the first step," Herbert said, adding state, county and city officers will work together to attack crime in the neighborhood — along with federal officers from the Drug Enforcement Administration. That will cost money, although the governor said how much is still unknown. "The Legislature has expressed a willingness to step up and help add to the resources that are already being provided by the city and the county," Herbert said. "I am willing, in fact, to call a special session" to address it. The governor added that the effort to remove criminals won't work "unless we have places to put them — jail space." So, he said, "We've had proposals presented to us to use Camp Williams. We have a proposal to open up Oxbow, which I think is a better proposal," which he would like to see pursued by possibly helping Salt Lake County with funding. While some have called for moving a state liquor store away from the area, Herbert said, "It's not high on my priority list." He acknowledged, however, that it may be a contributing factor to drunkenness in the area. He said that enforcing laws against drunken and disorderly conduct will be an important part of cleaning up the area. "We see people passed out during the middle of the day in the parks and in the medians," he said. "We heard yesterday of a story about people out trying to mow the lawn and we had a person there on the grass that they just had to mow around." The governor said, "That's not acceptable behavior. We need to make sure that we enforce the law, and that includes even the minor laws of vagrancy and trespass." He noted that former New York Mayor Rudy Giuliani, who had success in cleaning up his city, "called that the 'broken-window theory.' If you take care of the little things, then the big things will take care of themselves also. If you ignore those little things, then it's like we don't care about the law." He said that homelessness should not be confused with lawlessness. "They are not the same. We've done some really good things with homeless issues. And we're going to do more as we provide additional centers for the homeless people to go and help them get on their feet." The governor said, "We know the drug cartels are taking advantage and preying upon people. They are using them as mules. They use them as shields. That's going to stop." He added, "We are going to take back the streets, take back the Rio Grande area, take back Pioneer Park, make it a safe place. ... I believe if we work together, I believe I will be playing tennis out there in Pioneer Park."